I went into HANSEL & GRETEL: WITCH HUNTERS wondering what the conflict could possibly be. I obviously though it would involve fighting witches. I was right and the plot never becomes more involved than that. 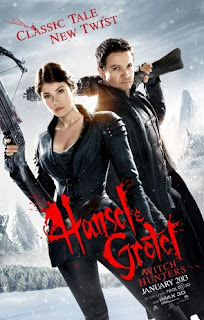 Hansel (Jeremy Renner) and Gretel (Gemma Arterton) are famous witch hunters hired by a town’s mayor to defeat a witch. Of course, it turns out that this witch is actually a grand witch, so she’s evidently more powerful than normal witches. To compound matters, the night of the blood moon is happening soon. This means all of the dark witches are going to be out doing dark witch things. It’s a pretty typical plot with a pretty typical outcome. Although, there is an interesting twist on why Hansel and Gretel were abandoned. It wasn’t just because they had an evil stepmother as the fairy tale usually went, but I’ll leave it at that. At only 88 minutes, the film doesn’t allow you to get bored or annoyed with the characters. It has all of the wonderful action flick tropes: corny, tough-guy lingo, fast editing, thrashing body parts and absorbing fight scenes. The movie is rated R, which allows for some awesomely intense death scenes. One character gets pulled apart by the limbs until he bursts. The makeup, wardrobe, and weaponry choice is fantastic and eye-catching, and there is even a Frankensteinian troll named Edward who is hilarious looking. HANSEL & GRETEL: WITCH HUNTERS is no more than a fun time. If you like fantasy and action movies, you probably shouldn’t miss this one. It puts an interesting spin on the fairytale and it’s a fast, fun ride that didn't disappoint. Considering the rubbish that is usually released this time of year, that's saying a lot. That said, it’s probably not necessary to see it on the big screen if you have a decent sized TV.